Anyone who's ever ordered pizza or other food for delivery has wondered how much to tip the delivery person. While a tip is technically not obligatory, not leaving a tip for the delivery person is rude. So, if you don't want to leave a tip, order the food for pickup instead. In addition to tipping, many restaurants now add a delivery fee to your bill (usually about $3 to $10 for the entire order). 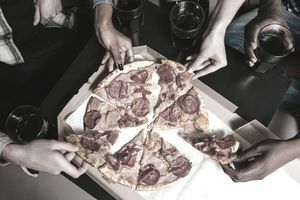 Sometimes, these delivery fees are higher when food is delivered to an office building or if the order is larger than a typical delivery run. Since delivery fees rarely, if ever, go to drivers, they should not be considered part of your tip. Also, a minimum delivery fee is not the same as a tip. It refers to the minimum price of food you must order for the restaurant to deliver. The restaurant owner may pocket an upfront minimum delivery fee and isn't required to pass it along to the driver unless they do not earn enough in tips to earn at least the federal minimum wage. For delivery orders of $20 or less, it is customary to offer a minimum tip of $3. For any amount over $20, tip 10 to 15 percent but never less than $5. Before opting for that $3 tip on small orders, consider whether you would make the same trip for a mere three bucks. If your driver was on time and polite, thank them with a better tip. Your food delivery driver is a mobile waiter, and you should not consider tipping optional. Although you can always opt to go for the recommended minimum tip, be considerate and factor in times and conditions in when a larger tip would be more appropriate. If the driver gave you outstanding service or preferential treatment. Typically, food delivery drivers are paid minimum wage or less and earn more from tips. If a driver’s tips plus hourly wage does not equal federal (or if higher, state) minimum wage, the employer must make up the difference. It is why most restaurants now charge a minimum delivery fee—it safeguards the employer from having to pay the driver to make up the difference if they do not earn enough tips. In essence, the delivery fee collected from you guarantees the driver at least minimum wage without the employer having to kick in. If the driver is making minimum wage based on their hourly pay rate, plus tips, minus the current rate of reimbursement per mile required by federal law, the employee probably does not get any of that delivery fee. Some drivers are paid a small commission for each delivery to help offset the cost of gas and use of their car. They may also receive a small stipend for displaying the company’s pizza delivery sign on their car. In addition to paying for their gas, insurance, and increased costs for wear and tear on their cars, delivery drivers may have to pay higher insurance premiums, carry extra coverage or pay uniform maintenance fees. In other words, being a delivery person is not lucrative, and your tips make a difference to the driver. If the service is bad and you decide not to tip, at least call the store’s manager and explain why your service was bad. The problem with the delivery may have had nothing to do with the driver but with someone else who prepared the order or with a manager who required a driver to deliver too many orders at once, so he was late, or the order was cold.